This year I decided to choose a plant to work with closely through the changing seasons in order to get to know it deeply and help me to incorporate some of the concepts of Geothean observation into my work with plants. When finding a new plant ally the idea is to be chosen rather than to choose, to see which plants grab your attention and won’t let go and then honour that choosing, whether you get what you expected or not. 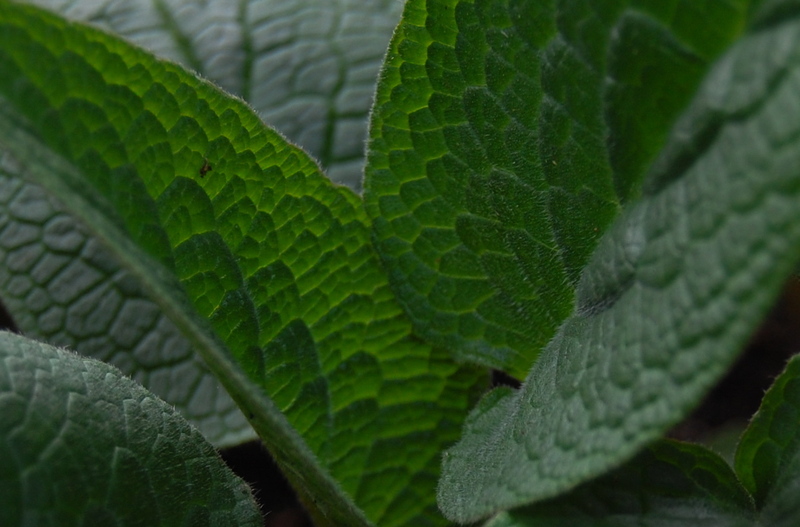 Well I certainly didn’t expect Comfrey, partly because it’s a plant I don’t often work with and partly because I had several other plants around me that I consider close allies and was expecting to be ‘chosen by’. I’ve been interested in the idea of Goethean observation for some time as it seemed to me a wonderful way of honing our senses, learning about plants and moving beyond ourselves and our limited perceptions to connect to the wider world around us. Goethe is best known for his literary contributions but, in fact, he was involved in the sciences too for much of his life. His work with plants was so unconventional at the time because he choose to study the species around him in their living environment, rather than dead herbarium specimens, so he could understand how they adapt and change throughout time. This idea of the ‘time-life’ of a phenomenon is a key principle of the Goethean study of plant life, helping us to understand them as changing, adaptive beings rather than something static or objectified. In this way we can be participants, rather than merely observers in their dance of becoming. 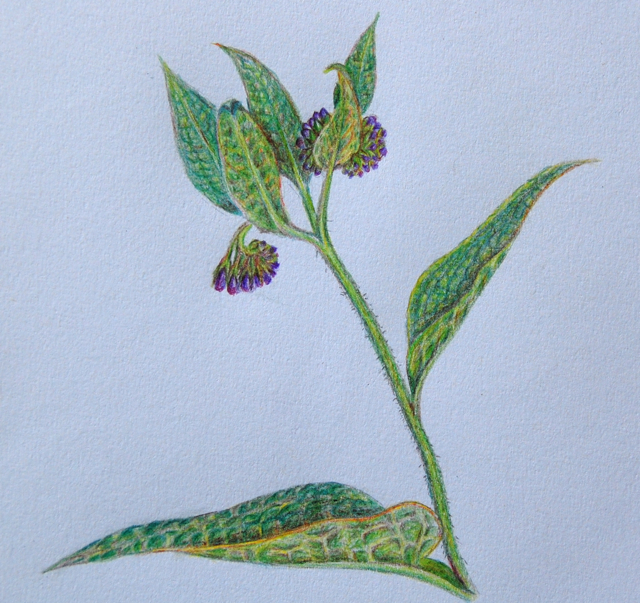 The idea is to observe the plant as clearly as possible, using all our faculties, blending what Goethe called exact sense perception, or collecting all the available facts, with exact sensorial fantasy, or understanding the growth, metamorphosis and flow of a plant through a more fluid and imaginative process. As we progress with these practices we move to a space where we can be completely open, allowing the plant to reveal something of its true nature to us through idea and inspiration. The final part of the process is described as being one with the object of perception, allowing a kind of divine meeting that Steiner referred to as “the true communion of mankind.” Drawing is seen as a useful tool in the process because it encourages us to consider all the details before us, exactly as they are experienced, rather than writing on our own perceptions. My original plan, to draw my comfrey every day throughout the year, has proven a little too time intensive in my ever busy schedule, so I’ve settled for sitting with her every day and drawing when things are a bit less busy. Only a couple of months into the process, it has already been a remarkable one. 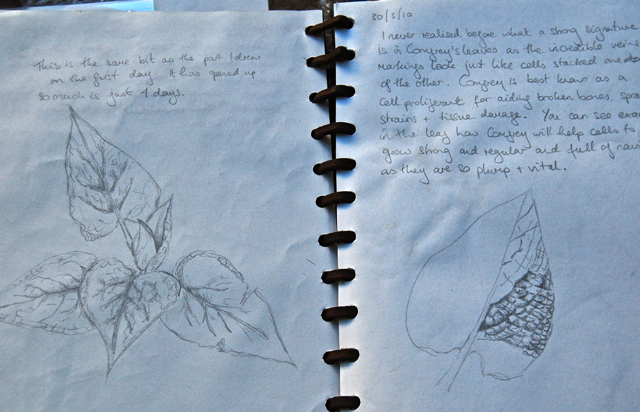 A page from my Comfrey notebook. 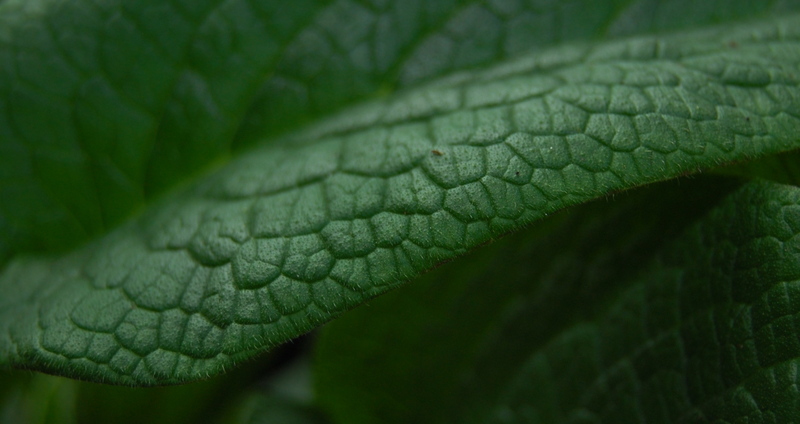 Now it may seem a little simplistic to apply the doctrine of signatures here, but to me, something in the leaves of the comfrey shows us very clearly both how it heals and how it harms, though cell proliferation, despite the fact that these actions are due to completely different chemical constituents in either case. Observe how the markings look just like cells under magnification, stacked one on top of another, growing strong and vital. Steiner writes “The human being cannot demand any other kind of knowledge than the one he brings forth himself.” I find this quote so empowering. It can be a challenge to trust our own inspirations and observations when working with plants and it’s so important to learn about their traditional and modern uses to get as wide a background as possible. That done however, we can start to enter into a new and less linear process, one that allows a state of inter-being to arise between ourselves and our green allies and allows whole new levels of understanding to permeate and transform our work and ourselves. I just had to comment and say how wonderful your observations are; I had no idea that Goethe studied plants, but his insights sound truly incredible. You have inspired me! Lucinda, finding your website is timely. I have just done about 40 sketches of broad beans I’ve put in water on differing days within the zodiac (am doing a course in biodynamics) and the subsequent growth over a couple of weeks. It has been a much bigger job than I thought: at times I was doing 4 sketches a night each taking up to an hour! But I am so excited by what I have witnessed, I find this new way of looking at plants, and a lot of other things, riveting. So I am now learning more about Goethe and just loved looking at what you have done, really like your keen observation of the comfrey leaf. I am pleased there are others out there getting in to this, great way of viewing the world. Thanks so much for posting this comment, it’s so interesting to read what you have been doing. I would love to know how you found the different days in the lunar and zodiac cycle to have affected the broad beans. I’m just starting a new book on Goethe called ‘The Wholeness of Nature- Goethe’s Way of Science’ so I should have more to write about my experiences of working in this way soon. Hi Lucinda, late one tonight: winding up assignment yay! As far as broad beans go i only put one bean in for a root, fruit, leaf, flower day so no real power in terms of study but interestingly the one bean that really grew in a balanced way (roots and stem) was on the fruit day which ties in with maria thun’s directions. So who knows! Your book title sounds interesting-good luck with your labour of love. I have found great knowledge and comfort in reading your blog. I am self taught with herbs and the more natural treatment of ailments. I have a huge comfrey plant. I am using your infused oil lesson as a starting point. Thank you for taking the time to write so openly and thoughtfully. I seek ways to use my herbs, and in searching out calendula versus comfrey for my pregnant daughter’s belly, I have been gifted with finding your site. And I have found a new idea of life to consider in applying Goethean theory. It can perhaps give form to the scattered feelings I get when out in my garden. Thank you Cathy. I hope the Goethean approach inspires you in your relationship with your plants!